Today marks the fortieth year of the famous “blue marble” photograph of Earth taken by the crew of Apollo 17. Earth seen from space on December 7, 1972. This iconic photograph has inspired millions of people over the years. By seeing the Earth hanging in space, we suddenly became aware if just how fragile our existence is. While environmental concerns were not new in the ’70’s, this picture put them under a magnifying glass, as have numerous images of our planet taken since this iconic photo was first released. It is interesting to see that programs designed to look beyond our planet can sometimes give us an even better view of our own challenges and opportunities. Apollo 17, after all, was headed to the Moon. It was great they thought to look back. Happy birthday, Blue Marble – and may we have many, many, more. 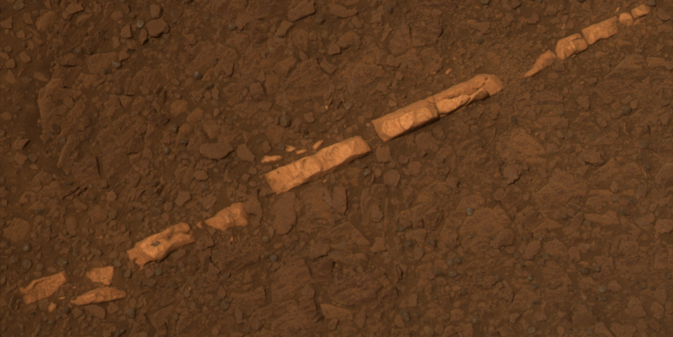 The Opportunity Rover recently discovered a band of gypsum (the stuff of dry-wall fame) that indicates that there was once running water on the surface of Mars – and that the water was likely to be sweet, not acidic, meaning it could support life as we know it (http://1.usa.gov/uR1VZC). With discoveries like this, can proof of extraterrestrial life be nearby?